Shared-nothing architecture (SNA) is a pattern used in distributing computing in which a system is based on multiple self-sufficient nodes that have their own memory, HDD storage and independent input/output interfaces. Each node shares no resources with other nodes, and there is a synchronization mechanism that ensures that all information is available on at least two nodes. Shared-nothing architecture is very popular in web applications, because it provides almost infinite horizontal scaling that can be made with very inexpensive hardware. It is widely used by Google, Microsoft and many other companies that need to collect and process massive sets of data. It is very important to understand that although shared-nothing architecture provides very high availability of your applications, it can’t be a replacement for backups. Automated synchronization of storage nodes means that all errors are automatically synchronized too: for instance, if you accidentally drop a database table, it will be deleted from all databases. Our software, Handy Backup, has a number of powerful plug-ins designed for backup and recovery of databases of different types. We welcome you to try it – it takes less than 2 minutes to setup and create your first backup! The Small Server edition of our utility allows backing up and restoring MS SQL, MySQL, Oracle, and other databases. 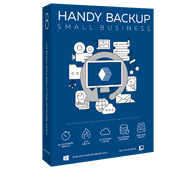 Try small business backup software for 30 days for free!